Organizer: Skeivt Arkiv Universitetet i Bergen. Curator/producer: Vibeke Hermanrud and Henriette Stensdal Kunstplass Contemporary Art [Oslo]. Welcome to this exhibition portraying queer nightlife and gay clubbing in Norway. The exhibition is the first one of its kind in Norway and exhibits a new collection of more than 1000 photographs, 100 posters and a timeline of more than 90 clubs and bars from 1950 to this date. In the efforts of preserving and conveying queer history, of different gender expressions and sexualities, there has been much focus on organizations and political rights struggles. This perspective is crucial, but informal meeting places and venues have been equally important for people's opportunities to develop identities and lives across society's constricted expectations of sexuality and gender roles. Queer nightlife - the culture and life related to bars, clubs and other venues - have played an important role for the LGBTQI community. 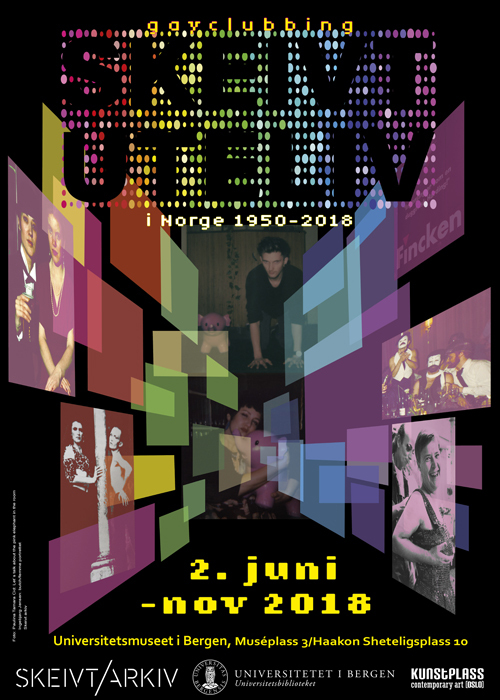 A neglected topic in Norwegian history so far, this unique project focus on queer history in an exhibition concept that combines the collecting, disseminating and the activation of users and agents. Coming In (1950 to 1972): A period where it was difficult to find like-minded people and to get access to the nightlife that existed. Secret clubs and venues became gateways a safe environment where you could be yourself in the company of fellow gay people. Coming Out (1972-1999): At first, the nightclubs were underground and emphasized discretion, but then came the 70s and the term "coming out". With more acceptance of being queer there was increasingly more room for openness and more bars popped up. Supersaturation (2000 - ): Since 2000 sexuality and identities are more fluid, and new venues and club concepts arise, such as Oslo Guerrilla Gay Bar who takes over an unsuspecting straight bar and transforms it into a queer hangout evening. People who have lived these stories are shaping the exhibition, through photos, objects, documents and filmed life stories. Three contemporary artists have furthermore been invited to interpret the zeitgeist of their era: Inge Ås (drawing and silk screen), Fin Serck-Hanssen (photography) and Paulina Tamara (photography). Initiator/organiser: The Queer Archives at the University of Bergen. Skeivt arkiv is the Norwegian national archives for queer and LGBT history. Our key mission is to collect, document and communicate Norwegian and Scandinavian queer history. Curator/producer: Vibeke Hermanrud and Henriette Stensdal from Kunstplass Contemporary Art [Oslo]. Thank you to all of you who have generously shared from private photo albums and archives! We are making queer history at the University Museum! LGBTQI: Lesbian, Gay, Trans, Queer and Intersex.